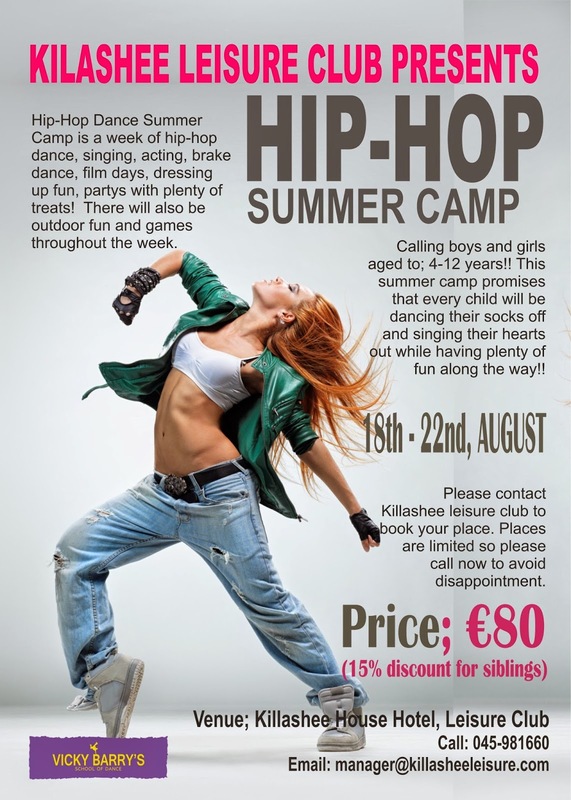 Enjoy a week long camp of Hip-Hop, brake-dance, commercial and jazz dance classes. The week will also include group singing, acting, performance classes, as well as games, fun, outdoor activities, movie days and party’s. Vicky Barry is a highly trained dance teacher who has studied all types of dance including Hip-Hop, Jazz, commercial, Modern Contemporary, ballet and also Acting and Singing in both Dublin (The College of Dance) and London (Millennium Performing Arts) after receiving a scholarship to study full time. Having been trained by the some of the best teachers in the world Vicky is now passing on her training to the children and teens of Kildare. She runs the Vicky Barry’s School of Dance in Kildare Town, Clane and Allen. Calling all boys and girls aged from 4-12years!!! This week long summer camp promises that every child will be dancing their socks off while having plenty of fun along the way!! All places must be booked in advance so please email or call now to avoid disappointment.